Advanced flutists may already know about how to use an abdominal "HA!" 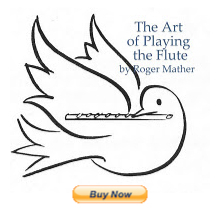 to add excitement and fullness to their articulated passage work on flute, but intermediates and novices may really find this video of great help. Nina Perlove teaches how to "POP" when articulating. Nina is showing this technique really well, and this kind of teaching is so very welcome on the internet. As I commented to you on Galway Chat; this is massively EXCELLENT!